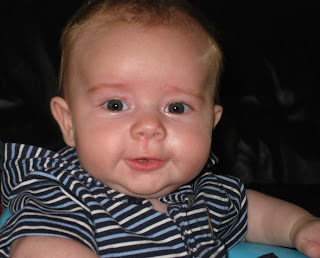 Life gets so busy that I don't have time to blog, eat, or poop. Sadly, a large majority of my life revolves around poo. From my own, my baby's, and my dog's, everything does come down to poo. As I've mentioned before, my home is in a new housing development. So, we have a lot of Mexican construction workers around, and they make a lot of noise. For some unexplained reason you can hear them very clearly when you are sitting on the master toilet. I don't know if it has something to do with the piping or what it is. But there is something very disturbing when you are trying to have a moment of peace and you feel like there are a bunch of Mexicans yelling at you. One time they were even singing. There's nothing like a Spanish serenade when you are on the pot. Let's talk about something cute now. Like my baby. (you knew that was coming didn't you? 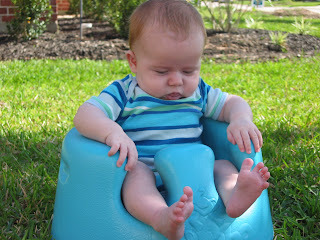 I can't let a post go without talking about baby Devin) My friend let me borrow this fabulous bumbo seat. I wish I had invented this splendid seat! It's better than any toilet seat. (see more potty talk, I can't get away from it) Although babies can't sit at 3 months, the bumbo let's them do just that. Devin is so happy sitting because he can see everything. I love it! And it makes for great picture taking positions. I tried it outside but he was too distracted to smile. 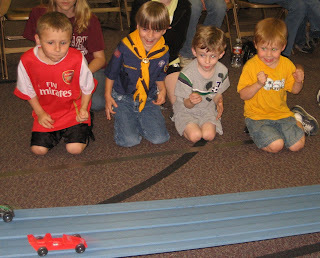 Cameron had his first Pack Meeting, which also happened to be the yearly Pinewood Derby. Cameron won every race until he raced against the other winners. He came in 3rd over all. It was very exciting! The Pine wood Derby was never as exciting when my brother's were involved. It's much better to watch your son! (sorry bro's) I think Scout's will be very good for Cameron. (Jason, don't groan) So far he has really liked it. And it seems to give him a place to belong which he so desperately needs. Cameron really likes to work on his goals to earn badges. Now if I could just get the school to give out badges for finishing school work! I love the Bumbo seat for photo opps too! 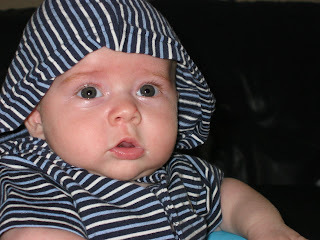 My son is 5 months old now and is still liking it.